When it’s time to wean your baby from milk to solid foods, an electric baby food blender, or ‘baby food maker’ as some have been branded, will save on time and washing up. And it's not just blending and chopping – some will steam, defrost and warm up too. While it's not an essential buy - especially if you already own a standard blender or would just prefer to manually mash and smooth foods by hand – a dedicated baby food blender will make food prep easier. Many also come with handy accessories for storing and freezing your culinary masterpieces in convenient batches. Here we’ve rounded up some stand-out electric baby food blenders, that will hopefully make things a little simpler in that adventurous first year of weaning. 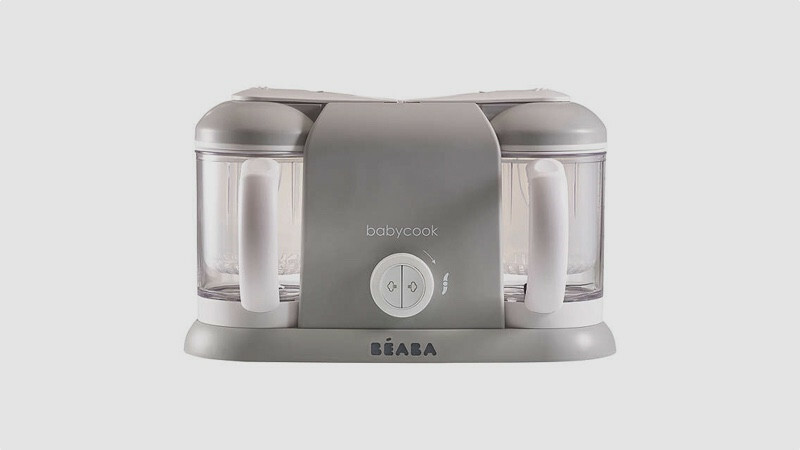 Use this 4-in-1 baby food maker to steam fruit, vegetables, fish and meat. You can then flip the jar over, lock it in place and blend the recipe to the consistency you want. As well as being able to blend foods smooth, you can also use the pulsing function for chunkier food combinations. There’s also a feature to defrost and reheat foods. As it’s one of the more compact designs on the market, it’s ideal if you’re a little low on countertop space, and quite frankly, who isn’t? And it you’re feeling a little stuck for inspiration, you can check in on the accompanying recipe booklet or download the complementing app, which offers age-appropriate weaning recipes, cooking guides, videos and tips. This design comes with an ample 1000ml jar, which can make around four meals at one time – this means that if the floor sees more of baby’s first meal than they do, there’s always three more meals that can be stored in the fridge or freezer as backup. Another 4-in-1 design that does more than blend, with steaming, defrosting and reheating features too. You simply pour water into the steaming tank and it will take about 15 minutes to steam a meal, alert you when its ready and automatically switch off the device. This safeguarding feature comes in particularly handy when you get sidetracked. The Beaba has a particularly large 2200ml capacity and it comes with two separate bowls so you’ll be able to make food in batches for storing and use at a later date. Its ‘manual cyclone–effect’ blade is designed to give you a range of consistencies, from smooth to chunky, while the removable steaming basket will collect nutrient-rich cooking juices from your food, which you can then stir into your baby foods. While it’s not the cheapest in our round up, it does come with a dedicated blending and smoothie filter lid, spatula and recipes booklet included in the box. The Tommee Tippee baby food blender is one of the easiest to operate and has won a number of Gold awards in the parenting world - for good reason. There are three settings to choose from on its push-button control that comes with an automatic timer. You can either steam and blend to your preferred time – usually 15 minutes, use the steam-only feature or opt for blend only. The device will take a range of foods including fruit, vegetables and meat and will create purees for small babies and also chunkier pieces for toddlers - all you have to do is fill the water tank and then you’re good to go. We particularly like its sleek white and grey design and at 19cm high by 29 wide its unobtrusive on the countertop too. It comes with two food storage pots and a spoon, which are reassuringly BPA free. 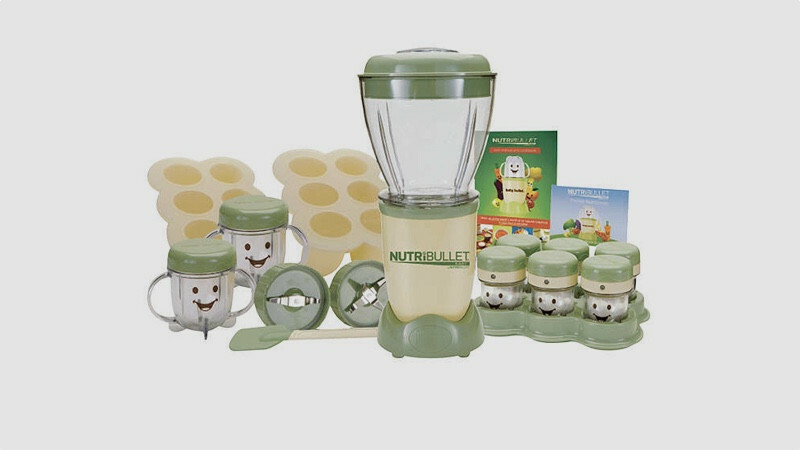 The NutriBullet Baby is one of the less expensive models in our test, and while it won’t steam or cook it’s a good option for cold purees and smoothies. This design is just as convenient and speedy as its standard adult counterpart. To us, simply place your ingredients in one of the two short cups or batch bowl, push on the power base and twist. There is one speed function and one pulse function so you can choose between purees for babies and more textured meals for older kids. We particularly like its zesty yellow and green design with six kiddy-friendly storage cups that feature dial dates so you can easily monitor when the batch was made up. The set also comes with a nutrition and cookbook manual too. 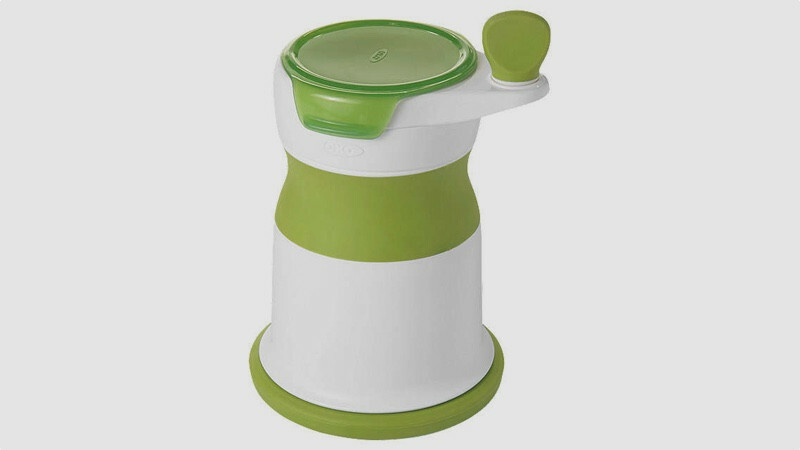 With a 1500ml steaming compartment and a 700ml blending compartment, the Babymoov Nutribaby+ boasts a large capacity. This comes in handy if you want to keep one step ahead by batch-making a week’s worth of food to store in the freezer. With 10 pre-programmed functions, visual and sound warnings, the control pad on this design is particularly easy to use too. 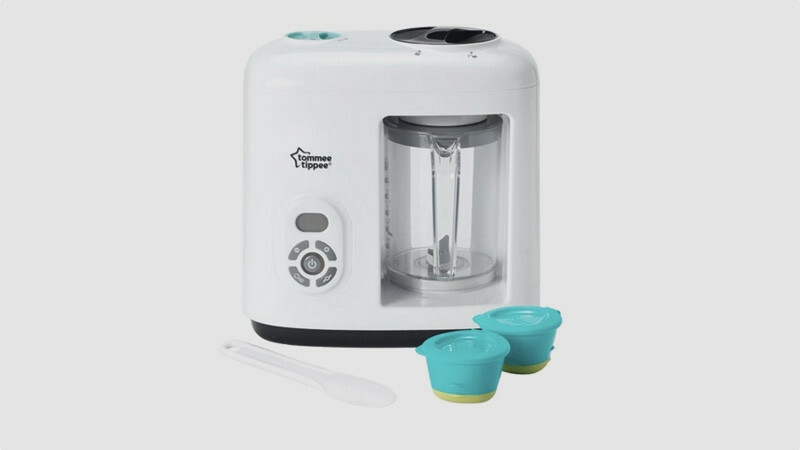 The Nutribaby+ is divided into two sections - on one side it will steam fruit, vegetables and meats and the other side will let you blend up to three different textures. This means that as well as making baby food, you can use it to make family meals too. You could steam a salmon on one side for example, and make up a delicious sauce on the other – a dish both toddler and adult can enjoy. What really makes this design stand out from the crowd however, is its extra bottle warmer and sterilizer features, which you can use from birth. There’s also a Cooking for Baby app you can access to find up to 400 recipes. What’s more, it comes in a choice of five stylish colours to match your kitchen. 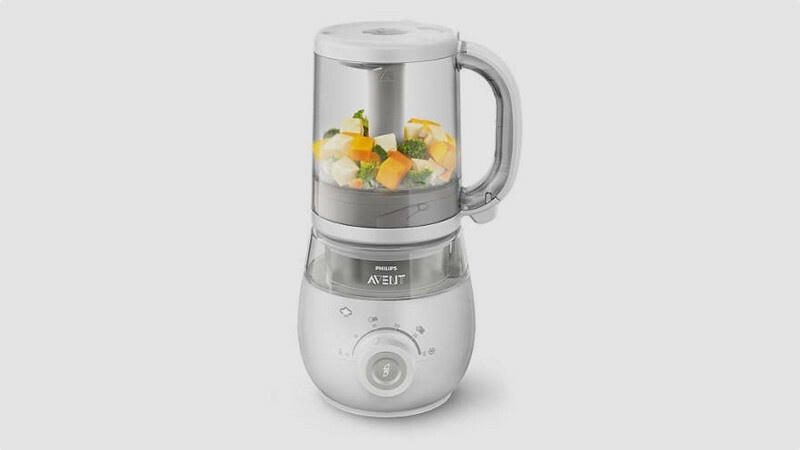 While it’s no substitute for the electric blenders we’re featured in our round up, this 23cm high device is rather nifty and travels well. Use it to easily combine and mash up cooked baby food, with no plug needed. It’s great if you want to by-pass the purees and go straight in for baby-led weaning with larger chunks and more textured foods. Inside it there’s a stainless-steel blade and grinding plate that works well to mash up foods such as broccoli, peas, carrots and potatoes. The design is easy to fill with food and it also takes a little liquid should the mashed mixture get a little too stiff. Once you’ve added ingredients to the feed tube, simply turn the handle and the blade and grinding plate will push the mashed food up to the top where you can scoop it out and serve to your tot.